- NZD presents traders an opportunity to get "tactically bullish". - Technical factors to support NZD rebound, particularly against EUR. - Morgan Stanley have been major Kiwi Dollar "bears" in recent times. The New Zealand Dollar could finally be due some respite from the relentless weeks-long sell-off that has now more than reversed a respectable 2018 gain for the currency we are told. Strategists at Morgan Stanley argue that current levels in the NZD in fact pose an opportunity for traders to get "tactically bullish" ahead of a potential rebound. Morgan Stanley's call comes as the New Zealand Dollar trades at a 2.5% loss against the US Dollar for the year-to-date, with the exchange rate having fallen by nearly 7% between April 17 and May 23 following an easing of global economic growth and shift in American bond markets that has shocked the greenback back into life during recent weeks. "We turn tactical bullish on NZD, expecting it to rally over thecoming month. NZDUSD should be supported but we see better risk/reward (and carry) in buying NZD vs the EUR," says Sheena Shah, an FX strategist at Morgan Stanley, in a recent note. The New Zealand Dollar had seen a strong start to the year when it rose by more than 5% over the US Dollar during the eight weeks to the end of February however, it has since been undermined by a loss of "yield support" at a time when short-term interest rates have returned as the dominant driver of currency markets. This loss of yield support has come as expectations that a trigger-happy Federal Reserve in the US will keep nudging its interest rate higher throughout the rest of 2018 have solidified, while the outlook for Reserve Bank of New Zealand monetary policy has become more progressively more dim. As a result New Zealand's 10 year Treasury yield has fallen from 3.4% at the beginning of 2017 to just 2.82% Wednesday, while the US 10 year Treasury yield has risen to multi-year highs above the 3.1% level this week. Similar is true of shorter term 2 year yields as well as longer-term bonds. "The recent rally in the USD has shifted any extreme long currency positioning within G10. Our own tracker has been showing most currencies within neutral territory. Our estimate of CFTC positioning, using its relationship with historical spot price action, suggests NZDUSD positioning is neutral to slightly short," Shah notes. This means that investors are incentivised to sell Kiwi Dollars and to buy the greenback in order to invest in the American bond market rather than vice versa. This is the opposite of how the so called carry trade, which has traditionally propped up the Kiwi relative to its international peers, used to work. "We express a tactical bullish view on NZD against the EUR. NZD appears oversold when measured using technical indicators like the RSI, and NZD looks poised to gain relative to other commodity producers from a terms-of- trade perspective. Risk reversals and positioning indicators suggest the risk/reward favors NZD buying as well," Shah explains. Above: EUR/NZD rate shown at weekly intervals. The 2018 shift in internation bond markets, combined with a more downbeat RBNZ, have been at the heart of the Kiwi Dollar's decline in recent weeks. But, as much as Morgan Stanley still holds a negative long-term view of the currency, Shah and the bank's FX team also say the recent sell-off is something that has been overdone and the Kiwi could now be due a short-term rebound. "Meanwhile, the EUR leg is an attractive short in our view,given weakening economic data, slowing political reform,and the prospect of rising political risks from Italy. A risk to this trade is that European data improve, leading to a reversal in EUR weakness," Shah adds. While the New Zealand Dollar may also enjoy a rebound against the greenback, US and Kiwi interest rates are at exactly the same level of 1.75% at the time of writing and the Federal Reserve is expected to raise its cash rate to 2% in June. 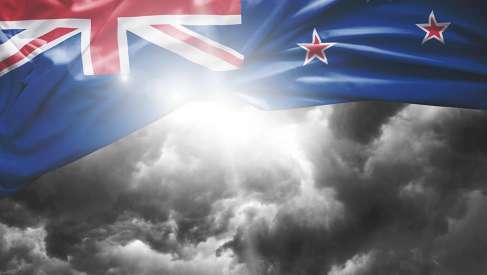 This means that yield dynamics could become even less favourable for the Kiwi relative to the Dollar during the weeks ahead, which might take some of the wind from the New Zealand currency's sails. However, the same cannot be said for the Euro because Eurozone benchmark interest rates are still deep in negative territory. Moreover, falling inflation and softer economic activity data mean the outlook for a normalisation of European Central Bank monetary policy has also dimmed in recent weeks. This puts the Euro at an equal disadvantage to the Dollar as it does the Kiwi although the New Zealand currency and bond market has an edge over Europe's single currency because the NZ interest rate of 1.75% is far higher than the zero percent refinancing rate and the negative deposit rate available at the ECB. As a result, Shah and the Morgan Stanley FX team have recommended to clients that they bet on a fall in the Euro-to-New-Zealand-Dollar rate to the 1.63 level. The exchange rate was quoted 0.01% lower at 1.6980 Wednesday, although the Morgan Stanley team entered the trade on May 17 around the 1.7140 level, placing a stop-loss at 1.7400.